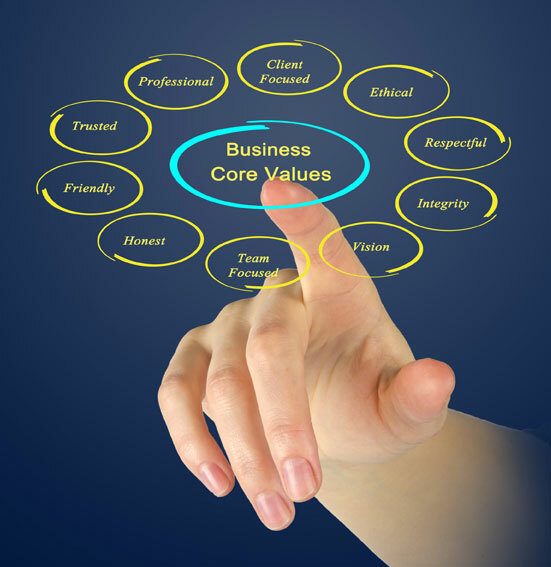 The core values of a company are similar to those of an individual. They are the collection of beliefs, ethics, and standards that steer your life or your work. Your company either has them or you do not, and you can choose whether you operate with them as guiding principles. What’s important to remember is that the values of a business define the core personality and culture of a company. And a business that consistently manages its operations based on a set of guiding principles, is a business that understands the connection between brand and values. Consider how strongly you are committed to your values as citizen and member of your community. Values influence our decisions regarding social connections, political affiliations, even purchasing decisions. As a small business owner, you must ask yourself first what your core values are, and second – how those values influence how you operate your business. Are you dedicated to integrity and value? Most people would say yes. However, not all businesses operate with a “we keep our promises” approach. Perhaps as a business owner you feel comfortable incorporating the social or political positions linked to your core values with your business and your brand. Think that seems like a violation (no pun intended) of church and state? There are some impressive brands with successful CEOs that would beg to differ. Ben & Jerry’s have posted along with their mission statement, a statement regarding their corporate activism. The company routinely shares its perspective on a number of issues that go beyond the production of ice cream – including their very public support for the Occupy Wall Street movement. That perspective has become part of the Ben & Jerry’s brand. Despite an acquisition by Unilever in 2000 for $326 million, they continue to embody their homegrown, unique connection of brand and values. Want a cup of coffee to go with your ice cream? Starbucks boasts a mission that tightly aligns with the value system Howard Shultz has built the company on since taking over as CEO. The Starbucks brand, listed # 76 by Forbes on the top global company list, has addressed the US government shutdown, gay marriage, and gun control just to name a few issues. It does not seem to have put a dent in the company’s $13.6 billion dollars in sales last year. Publish your core values and share them with employees, shareholders, and customers. Keep in mind that people will judge your brand on how well you align your operations to the values you claim. If you plan to make your political beliefs known, be prepared to have negative consequences from customers that disagree with your perspective. People tend to support companies that they believe support their values. If you think this sounds like a small thing, just recall the recent news stories of the Chick-Fil-A stand on gay marriage or Paula Deen’s racial remarks that resurfaced during a lawsuit. If your plan is to focus on the core values that you know matter to your customers, such as striving for excellent customer service, committing to a green initiative, or contributing back to your local community, then stay consistent and resist the temptation to join political or social causes that involve your brand and your store locations. Make your values work for you. If you believe in putting the customer first – are you keeping your promises – consider making it part of your tag line and build it in to marketing campaigns. Just remember if you build your brand on a promise, make sure your operations and your employees understand the importance of that promise and always act with your company’s values in mind. Core values and brands are closely related. If you follow some simple best practices and stay consistent with your approach, you can productively impact your brand. Remember, a great brand is usually attached to a growing company who knows who they are and what they stand for. Next up: The importance of building on your core values to create a vision and mission for your company that will inspire both customers and employees. Thoroughly enjoyed the blog! Core Values are the DNA – whether it’s an individual or an organization.